Fishing was slow for me yesterday morning. The day was beautiful and the river was at a great level for dry fly fishing to rising fish and good holding spots. I started by fishing a sizable pool and tail out of about 200′ that has been a good producer, but this time I got no satisfaction. No fish that is. Moving downstream to a couple of sections of river that I had eyed some weeks before, changed things a bit. I saw a few fish rising just as soon as I arrived and as there were some caddis in the air, I tied an 18 dun colored CDC caddis on the pointy end of my tippet. A couple of casts later and a rising fish took that fly. It was one of the young browns that F&G hopes will establish a population in a watershed that has marginal temps in summer. 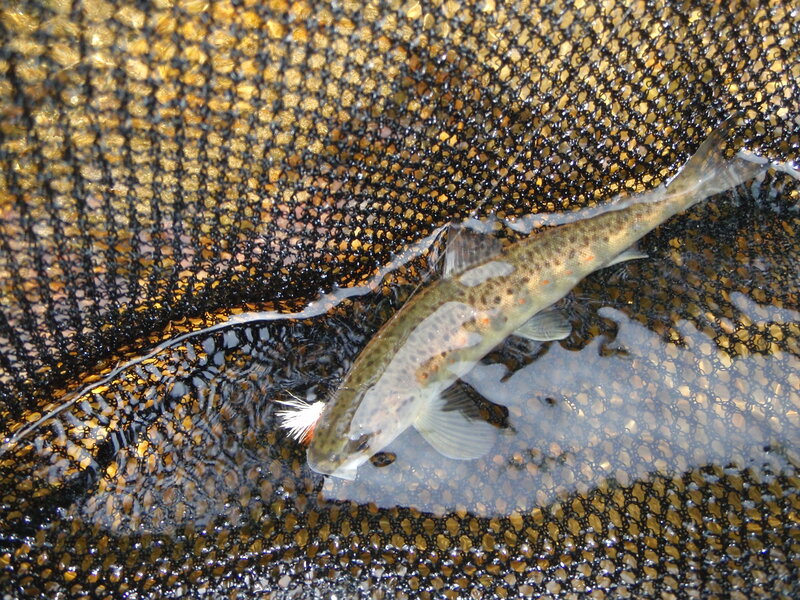 Some fish do holdover in deeper pools and runs shaded by foliage and in tailwater below a few dams and spillways as they find there way up or down stream. I reached for my drying agent to treat that CDC and realized that I had neglected to move it from my hip pack to vest when I switched last week. The trout spit had made the CDC all but unusable, so I tied on a deer hair caddis and offered that to a couple more risers. After some enjoyable casting to a 6″ x 6″ lie behind a rock I was rewarded to another parr. Not what I was hoping for, but fishing all the same. Its great fun to identify a rising fish in a small holding pattern–knowing that he will only take what is within that small window and working to drop a dry on that pie plate. There is no better and exciting way to coax such a fish…subject to opinion of course. The next was pretty much a repeat of the first two, so I moved on to a tree fall downstream that I thought might be more fishable since the water had gone down. It was fishable but I saw no risers and though I gave it a try anyway, the only catch was a log. Another hour and a bumped fly called me home. Such a time as I had just experienced often leaves me with a sense of ‘something left undone’, so along about 7:30 pm after supper I decided to head down to a big old pool close to the house where I know a few big wary browns hang out. This is the same spot responsible for the demise of my 4 wt. Redington and a couple browns and a rainbow a few weeks ago. It was already nearly dark with sunset coming at 8:10 and there were a couple spin guys upstream a bit, so I headed downstream to a story for another time. The mosquitos and dark chased me out after about twenty minutes, so I headed back up the trail that led to relief and home. I found the spin fishermen gone and that wonderful sound of rising fish in the dark of a slow easy moving pool. There were caddis in the air and on the water and it was as lightless as it gets in small town New Hampshire. I decided to toss a #12 stimulator out there and feed line downstream and then strip it back like a bait fish. This tactic has worked in the past and is as good as any for cruising browns in the dark; especially when fishing a pool with storm-placed trees and branches along the bottom. Well I was rewarded with a very strong take on the pause of a stripping sequence. The new Redington 4 wt bent well over and it was no time at all that I had that baby on the reel. And that reel was singing a sweet song in the dark as that big brown ran! I thought to myself, “this fella is a big one” and then to “protect that 5x tippet and just how good is the Davy knot anyway”. After a few minutes of great fun and anticipation and just as I was getting ready to reach back for my net, he was gone! What the heck? Broken tippet? Failed knot? My heart sunk all the way to my feet and colorful words moved forward. I retrieved that line in and ran the leader up through my fingers in the dark only to find that the knot had held and the fly was fine. Man, what a drag. Oh well–he is still there and there are more evenings to come. I suspect he was the biggest fish of the season and though he didn’t see my net, I’m thankful he gave what he gave. Big cruising browns in a slow and easy moving pool in the dark. Good fishing. Mighty good fishing. ~ by John McGranaghan on May 23, 2010.